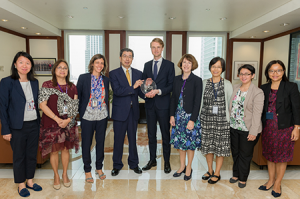 The Asian Development Bank (ADB) has earned EDGE Move, the second level of certification for workplace gender equality from the Economic Dividends for Gender Equality (EDGE), becoming the first international financial institution (IFI) to achieve such recognition. Launched at the World Economic Forum in 2011, EDGE certification uses a rigorous analytical third-party holistic approach to measure where organizations stand in terms of workplace gender equality in the areas of equal pay for equivalent work, recruitment and promotion, leadership development training and mentoring, flexible working and organizational culture. EDGE Move showcases the progress of organizations that reach certain gender equality benchmarks. ADB received its first level certification in December 2016. To increase gender equality in the workplace, ADB has put in place a 17-point action plan, encompassing recruitment, career management and retention, and learning and development. The action plan includes the target of at least 40% women international staff by 2022. “Gender equality in our workplace is an ongoing agenda. We should remember that these achievements are the result of deliberate actions and may not continue if we become complacent,” said ADB President Mr. Takehiko Nakao, as he requested ADB managers and staff to sustain the progress towards gender equality. ADB is strongly committed to help narrow gender disparities in Asia and the Pacific, an urgent development agenda in the region. In its corporate strategy, ADB vows to accelerate gender equality in 75% of its projects by 2030. ADB is among the 16% of all current EDGE-certified organizations globally, including IFIs, which have achieved the EDGE Move certification level. EDGE grants three levels of certification.